The Peace River Manasota Regional Water Supply Authority is the latest entity to vote in support of efforts by the Conservation Foundation of the Gulf Coast to acquire Orange Hammock Ranch, The Sarasota News Leader learned this week. That board voted just two days after the Sarasota County Commission unanimously endorsed the initiative on Jan. 26, Christine Johnson, president of the Foundation, told the News Leader in a Feb. 1 telephone interview. Nonetheless, the Florida Legislature’s current deliberations about how to spend revenue guaranteed by the 2014 passage of Amendment 1 is potentially the most important factor in the process, Johnson said this week. The Foundation’s option to purchase all 5,774 acres of Orange Hammock Ranch, which is located on the north side of Interstate 75 in the city of North Port, expires on June 4, she pointed out. The property is listed at $22,807,300 by the Orlando real estate firm of Dykes Everett & Co., the News Leader learned. March 11 is scheduled as the last day of the current legislative session. “We have to cobble together all the different sources of money,” Johnson added. Not only is the Foundation staff hoping for significant assistance through the Florida Forever program, she said, but it also is working with regional water districts and other local entities — including private ones — to achieve its goal. The Foundation has sought an independent appraisal of the Orange Hammock Ranch as well, she noted. It expects to have that figure within three to four weeks. 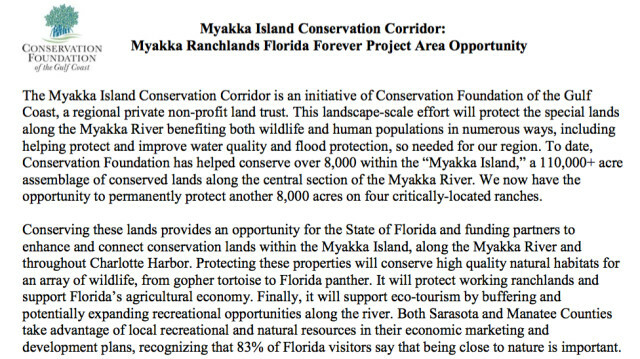 In 2014, the Foundation was successful in getting three large properties along the Myakka River — two of which are entirely in Sarasota County — placed on the Forever Florida program listing for funding assistance as part of the Foundation initiative called the Myakka Island Conservation Corridor, Johnson pointed out. Then in December 2015, following the annual review of that list, the Corridor held the No. 5 position, she said. The other two pieces of land in Sarasota County are the 543-acre Murphy Marsh — the only link between the Myakka River and 1,213 acres of marsh already protected by a conservation easement, according to information the Foundation provided the County Commission last month — and the 720-acre Sheps Island Ranch, which shares more than 3 miles of boundary with Myakka River State Park. 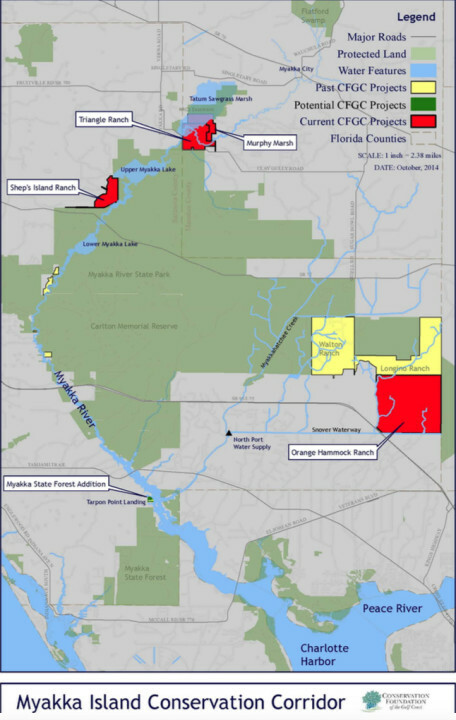 Yet another component of the corridor is the 1,067-acre Triangle Ranch in Manatee County, which includes 3.2 miles of the Myakka River, just upstream of the state-designated “Wild and Scenic” portion of the river, the Foundation noted in the material it gave the County Commission. To protect the City of North Port’s drinking water. The Snover Waterway is “a critical source” of the city’s drinking water supply, the fact sheet says. Preserving the lands around it will foster natural filtration of the water as it flows into the city’s system. To reduce flooding risk by keeping water on the ranch. To provide access for public recreation and ecotourism. 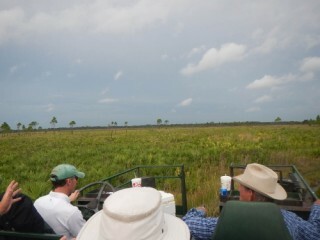 The conservation of the ranch will help safeguard the Charlotte Harbor estuary and strengthen the protection of, and connection between, the Myakka and Peace rivers for both people and animals, the fact sheet notes. To protect property values, “as conserving land is good for the economy.” The fact sheet points out that 70 percent of the lots within the city of North Port are still un-built, and 11,000 homes are planned for the west side of North Port. The greater the supply of land, the lower prices of homes, the fact sheet adds. During the Jan. 26 regular meeting of the County Commission in Sarasota, Johnson; her board’s chair, Eileen Zimmerman; and Debi Osborne, director of land protection for the Foundation, all appeared during the Open to the Public agenda item to ask for the board’s endorsement of the Foundation’s plans. 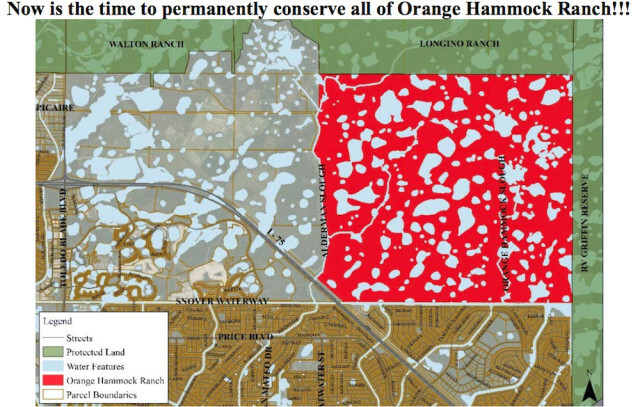 Johnson pointed out that this is only the fourth time in 20 years that Orange Hammock Ranch has been offered for conservation. In 2010, she added, the county put the ranch on the list of properties it deemed worthy of preserving through its Environmentally Sensitive Lands Protection Program. Some people have said the property was identified more than 20 years ago, she added, “as the ideal site for land conservation” because of its strategic location adjacent to the RV Griffin Preserve and the Longino Preserve. In response to a question from Commissioner Christine Robinson, Johnson said that conserving the property would not preclude recreational uses of it. “It’s helpful to know that,” Robinson replied. “There’s nothing going on on that piece of property that can’t continue to go on [there],” Johnson said. Among the current activities are hunting, cattle grazing, hiking and even some bike riding. “It’s been well maintained with all those recreational activities,” she pointed out. Vice Chair Paul Caragiulo made the motion to support the Foundation in its efforts to purchase the property. Commissioner Charles Hines seconded the motion. Robinson added that she also would support the motion. 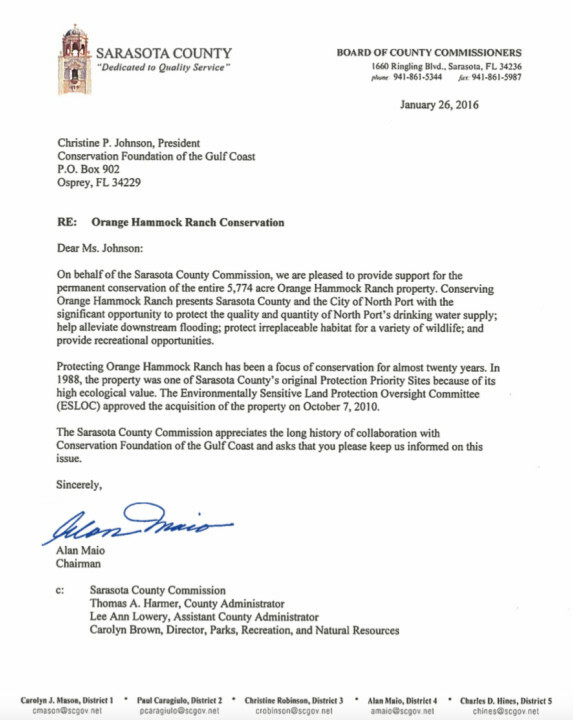 In December 2014, she said, she had to oppose the Foundation’s request for board support of its efforts to get Orange Hammock Ranch on the Forever Florida list because the City of North Port opposed the initiative. At that time, North Port city commissioners and the North Port Area Chamber of Commerce were hoping part of the property could be developed for commercial or residential purposes, city leaders told the County Commission. Cook was one of several representatives of the City of North Port who appeared before the County Commission on Dec. 9, 2014 to ask that the board refrain from supporting the Foundation in its quest to have the ranch placed on the Forever Florida program list. During the discussion that day, Commissioner Caragiulo told his colleagues, “I am a big fan of the Conservation Foundation.” However, he continued, given North Port’s opposition and the fact that he is “a strong believer in home rule,” he had to side with North Port. Then-Chair Carolyn Mason and Robinson concurred with Caragiulo. Commissioner Hines added that he wished part of the property could be conserved while North Port pursued development of the section it was eying for commercial purposes. But the owner was not interested in splitting up the land, Caragiulo pointed out. 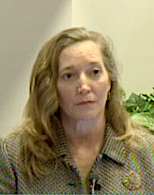 In an email she sent on Jan. 18 of this year to Carolyn Brown, director of the county’s Parks, Recreation and Natural Resources Department, Commissioner Robinson forwarded information from North Port City Commissioner Linda Yates, indicating that portions of Orange Hammock Ranch that were thought to be developable apparently were not zoned in accord with those plans because of a mapping error. In a Jan. 20 email to Brown, Michele Norton, planning manager in the county’s Neighborhood Development Services Department, confirmed Yates’ research. Chair Al Maio said he had been on the ranch multiple times through the years and was fully supportive of the Foundation’s efforts, too. Caragiulo’s motion then passed 5-0.